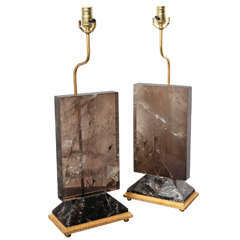 A pair of luxury dark rock crystal quartz bulb lamps with polish brass frame. Created by Phoenix Gallery, NYC. Each lamp installed two sockets. To the top of the rock crystal 17 inch. Lampshade not included. 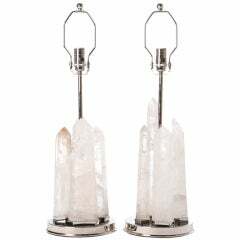 A pair of luxury dark rock crystal quartz bulb lamps with polish nickel frame. Created by Phoenix Gallery, NYC. Lampshade not included. A pair of luxury dark rock crystal quartz bulb lamps with polished brass bases. Created by Phoenix Gallery, NYC. Lampshade do not included. 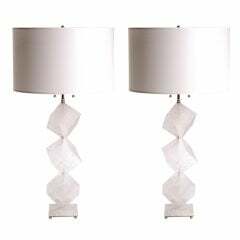 A pair of luxury white rock crystal quartz bulb lamps with antique brass bases, created by Phoenix Gallery, NYC. Each lamp installed two sockets. Lampshade not included. 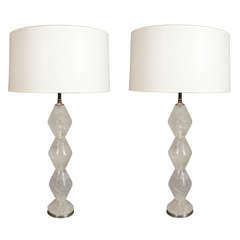 Unusual pair of Deco style rock crystal quartz table lamps on gilt metal rectangular bases. Stock Number: MD18. Hand-cut rock crystal sphere lamps on nickel-plated brass bases. Double socketed with nickel-plated brass hardware and pull chains. 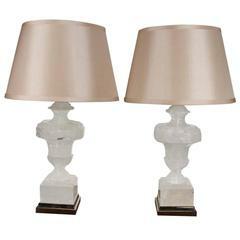 Large, contemporary, urn-style, rock crystal lamps on silver and gilt metal bases. 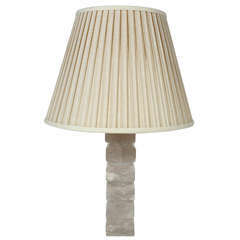 Rock crystal table lamp, brown and ivory tones. Black stone base. Perfect condition. Hand-cut rock crystal obelisks mounted on nickeled brass bases. Double socketed, with solid brass nickeled hardware. Also available with brass bases. 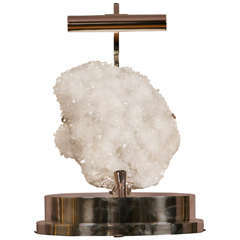 Solid rock crystal cube lamps with nickel and rock crystal bases. Nickel plated brass hardware. Double socketed, with pull chains.